The mountainous and rough area between Glen Carron and Glen Torridon is known as Coulin Forest and several Munro and Corbett peaks sit there waiting to be explored. 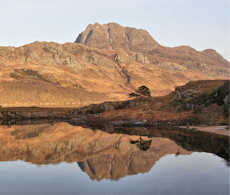 To the east, Slioch is an impressive mountain dominating the view as travellers drive along the shores of Loch Maree. Three days of hiking up high mountains in the Northern Highlands. Walk along fine crests and rugged terrain above hidden lochans and huge cliffs. 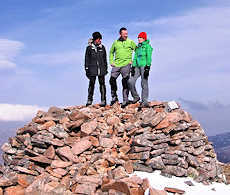 Reach superb vantage points from where vast views can be savoured, particularly over to Torridon, Applecross and Skye. 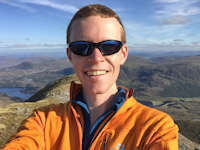 Bag 4 Munros in the area including Sgor Ruadh, Beinn Liath Mhor, Maol Chean-dearg and Slioch. Option to extend the days by hiking up a nearby Corbett peak or two. 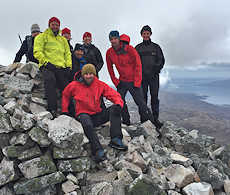 This is a 3 day event of guided hiking to high summits in the North West Highlands with one of our experienced and qualified leaders. Your guide will know the areas well and be able to give you insight into the flora, fauna and geology. South of Torridon, the two mountains of Beinn Laith Mhor and Sgor Ruadh are separated by a high col. Most people approach from Achnaschellach to the south, but we're heading in from the north, which is more scenic and interesting. We start the day from the Coire Dubh car-park in Glen Torridon, just below mighty Liathach. 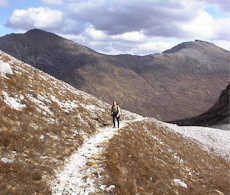 On a fine path, we'll head south into a remote area, and arrive at the coires below Sgorr Ruadh and Beinn Liath Mhor. Up the screes on Sgorr Ruadh first, there's some easy scrambling near the summit. Back to the col, then over shimmering quartzite boulders to gain Beinn Liath Mhor's exposed summit with its superb views. We'll then begin our return, hiking over heather then aside lovely waterfalls to retrace our steps along the path we came in on. A rough Munro, with an even rougher Corbett nearby ! This day includes some easy sections of bounding and scrambling on rough quartzite and sandstone blocks - a fine taster for those thinking of heading to nearby Torridon at later dates ! We begin our day just south of Torridon, on a fine path heads southeast around Beinn na h-Eaglaise to Bealach a'Choire Ghairbh. Uphill next, we leave the path behind and scramble up loose quartzite, then over sandstone boulders to the large cairn on Maol Chean-dearg's summit. After taking in the views, we can return the way we came in, or if the group is up for more fun, extend the day by aiming up nearby An Ruadh-stac next - a fine Corbett peak ! This will require hands out of pockets for some of the rough scrambling to the summit ! On this day we'll follow good paths hugging the shore of Loch Maree and pass waterfalls on the way. 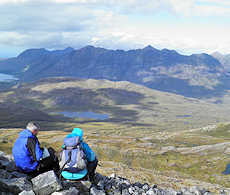 Higher up we'll reach lofty vantage points to gain superb views, including an expansive vista over Fisherfield - one of Scotland's last true wildernesses. From Kinlochewe we'll walk along fine paths cutting through grass and bracken and reach the shores of Loch Maree. Over a tumbling river with waterfalls and pools higher up, we'll hike and clamber up into dark Coire na Sleaghaich, where Slioch's complex topography begins to become clear. Passing some lonely lochans higher up, the views expand as we progress onto the summit. We've options for the return depending on the conditions and group desire, the most interesting of which takes us via a ridge to the minor summit of Sgurr an Tuill Bhain. The routes have good approach paths in the glens with rough faint paths leading to varied terrain higher up. The first two days are classed as 'demanding', with the final day's hike as 'moderate'. 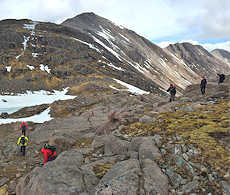 The second day's option to include the Corbett peak of An Ruadh-stac does involve some easy rock-scrambling up to 'Grade 1' . We are likely to encounter winter conditions on the 22-24 Mar'19 event and if this is the case, we ask that you come appropriately equiped. We can help with some of the necessary gear (eg ice-axe, crampons) and coach you in their use if needed. Leading the event on 11-13 Oct'19. We'll be based in the Torridon area which is situated around 50 miles west of Inverness on the A896. The last 10 miles of road between Kinlochewe and Torridon is single-track. There is no reliable public transport to Torridon.